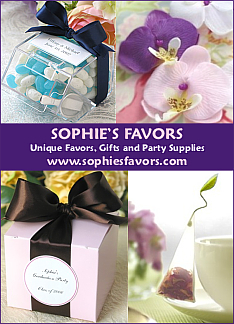 Make or Buy Decadent Baby Shower Candy and Personalized Candy Baby Shower Favors for your baby shower favors, decorations and more. Who Doesn't Love Candy! It makes a delicious accessory to cakes, cupcakes and cookies. So, go ahead and spread the love by "sprinkling" some candy around your baby shower. Don't feel like making candy? 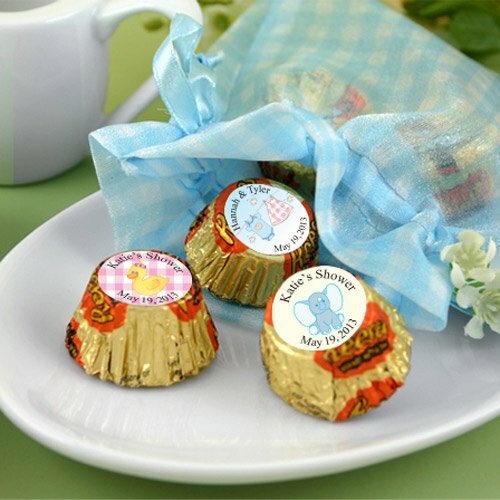 Then check out our Personalized Baby Shower Candy Wrappers and personalized candy options at the bottom of this page ... they're adorable! We found some variations on both ideas. Making candy is such fun! Tip: Remember ... be mindful of your time. You can always make candy ahead of time and freeze it in an air tight container. This is such an easy decorating idea. Scatter some candy at the base of the baby shower cake, serve them in a crystal baby carriage dish or just on a simple glass plate. 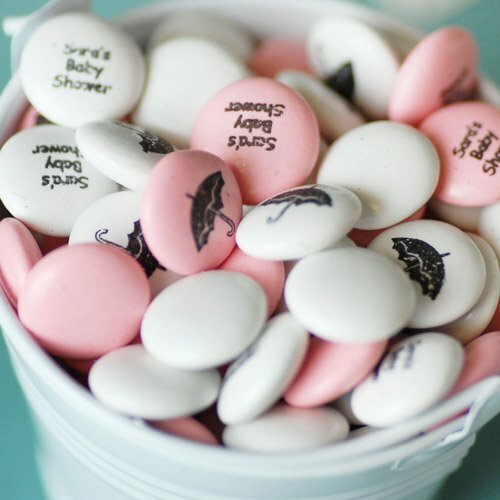 For an easy favor idea, make personalized candy baby shower favors. Just wrap in a decorative cellophane around your candy and tie with a coordinating ribbon. Or, make it a prize for one of your baby shower games. Use a decorative jar and fill it to the brim with candy. Tie a ribbon around the opening of the jar. Tip: Again, think about your time … this is where a creative co-hostess can come in handy! Buy See's Candies 1 lb. Truffles in bulk and place in truffle boxes. These Personalized Candies are very cute. Hershey's Chocolate in personalized candy wrappers for any size you need. Choose from Kisses, Miniature's and also a King Size Bar. or for decorating your baby shower cupcakes or baby shower cake! Icing Recipes For Your Baby Shower Cake, whip up delectable creations! 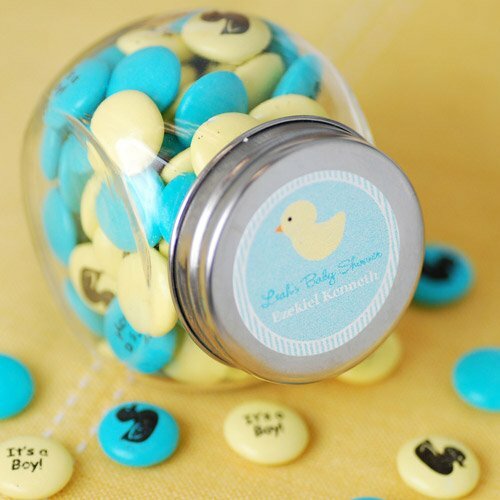 Baby Shower Candy makes adorable baby shower favors. Buy them pre-made or use our DIY baby shower favor ideas!